If you’ve subscribed to my newsletter, you’ve probably already been made aware of this, but I just want to make sure I’m covering all my bases here. 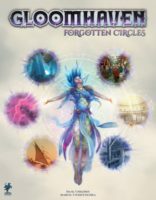 Forgotten Circles, which I’ve discussed at length previously, is finally ready for the printer, and so I’ve launched a pre-order for it. It’s not a fancy Kickstarter or anything, but I just wanted to make sure everyone who wanted the expansion was able to get it without going through the hassle of ordering it elsewhere and having to worry about whether that order will be fulfilled. We’re trying to print enough to meet the demand of retail, but, as always, it’s difficult to gauge exactly what that is, so pre-ordering through me is the sure bet. Game should be released in 2019 Q2 (05-15-19), so watch the news!